Resources - Metro Benefits, Inc. The Metro Benefits Newsletter is a publication written and edited by our management staff and is designed to keep you clearly informed of current events in the employee benefit plan arena. ERISA requires that plan assets must be covered against theft and fraud by a fidelity bond. The amount of the bond should be for at least 10% of the plan assets. If you do not currently have fidelity bond coverage, please contact your property/casualty insurance agent to obtain this bond coverage. national online insurance company that is U.S. Treasury listed and licensed in all states and territories. As experts in all aspects of ERISA regulations, Colonial Surety Company will ensure that you are properly bonded and that your bond is renewed prior to expiration so that your plan remains in compliance. You may also contact them at (888) 383-3313. Metro Benefits, Inc. has been voted one of the 2017 Best Places to Work by the Pittsburgh Business Times. Check out the Pittsburgh Business Times October 27, 2017 Edition to see the full list. 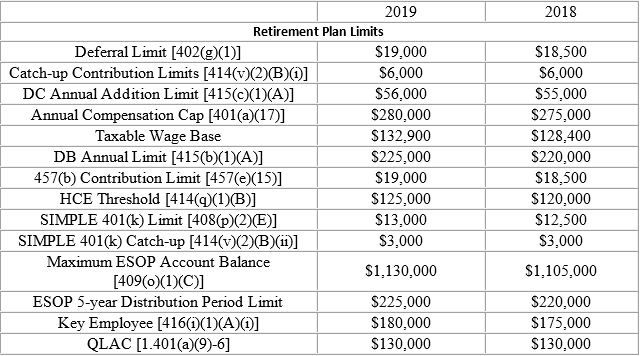 The IRS has set the retirement plan limits for the 2019 plan year with the release of IRS Notice 2018-83. Additional limits and limits for prior years can be found on the IRS website.